Positano Hostel i Santa Marta, Colombia: Reservér nu! Located in the heart of Santa Marta - Colombia, POSITANO HOSTEL is the perfect place to enjoy the city's sunny weather all year long. After a short 5 minute walk from the hostel, you will find the 'Camellon' beach, the International Port with all its bars and restaurants, and the Historic Centre, where you will enjoy the old city's architecture, the 'Lovers Park' (Parque de Los Novios), the Simon Bolivar Park, the Gold Museum, the old Cathedral and its square, and the San Francisco church. Right in the center, there is as well a wide range of gastronomic offerings and a fantastic nightlife. 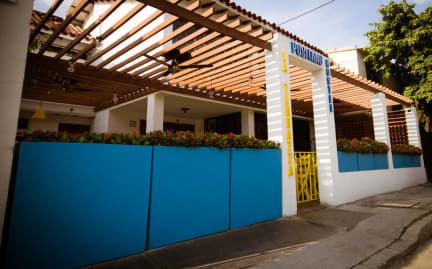 Furthermore, the hostel is strategically located just a few steps away from the main road of access to the city, where you will find transport routes (both local, and inter-municipal) to the Tayrona Natural Park, 'El Rodadero' beach, Taganga, and nearby cities Cartagena and Barranquilla. Very close as well there are various supermarkets, shopping malls, banks, and stores. We are just a 15-minute drive away from the 'Hacienda de San Pedro Alejandrino,' the place where Simon Bolivar died, and famous for its beautiful gardens and centuries-old giant trees. The airport is easily reachable by car or public transport in just 20 minutes. A bit further away, in about 40 minutes by car, you will find the 'Minca' natural reserve, a peaceful little town up in the mountains of 'La Sierra Nevada de Santa Marta. 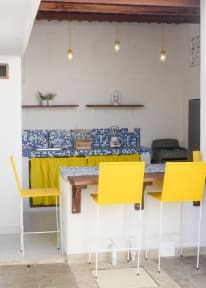 Positano hostel santa marta has a 4 different types of dorms and one private dorm, we has a equipped kitchen , board games swimming pool, cable tv, air conditioning, tv zone, and one terrace where our bar is.